The Smithsonian includes eleven museums on the Mall and another six off the Mall. It is probably the greatest collections of museums in the world. And, they are all free admission. 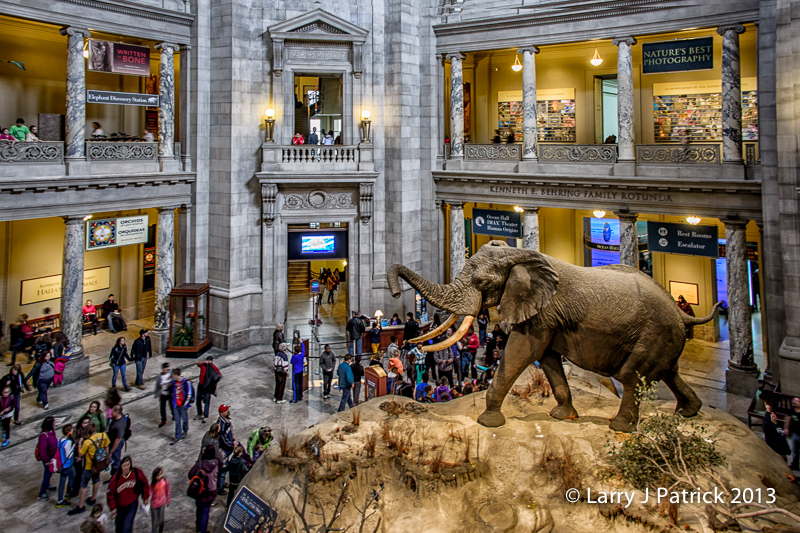 My two favorite museums are: the National Museum of Natural History and the National Air and Space Museum. But, I must admit, the American History Museum and the American Indian Museum are also high on my list. When Monte and I took our “guys-only” trip to Washington, D.C., we visited the National Museum of Natural History every day. It was Monte’s favorite museum. At the time, I was also in complete amazement of what was within its walls. Today, I am not nearly as amazed. Why? Because of the Houston Museum of Natural Science, which is not as large, but presents its paleontology and gems & minerals so much better than the Smithsonian presents it. For anyone who has not been to the Houston Museum of Natural Science, I encourage you to go, especially to the Hall of Paleontology. Today, photo is of the museums rotunda. I wanted to capture the size, the general architecture and the crowds within the museum. Camera settings: Nikon D4, 28-300mm f/3.5~5.6 at 28mm, ISO 1000, f/8 at two 1/30th with my camera supported by the railing. Good job showing the entry. Been there many times.